For many, a hotel stay signifies a break from the day to day hustle and bustle and an opportunity to provide, not only the body with a rest from the stresses encountered every day, but the mind too. As such, it is crucial that the overall health and wellbeing of the guest is considered when a hotel is being designed and that solutions are integrated into the interiors and architecture. Indeed, carefully designed interiors have been shown to have a positive impact on the wellbeing and mental health of those who stay there. From ensuring the perfect lighting scheme and cutting-edge fitness equipment to bathrooms that offer ultimate relaxation, there is much to be considered during the design process to ensure the result is an environment that is not only aesthetically appealing, but has a lasting effect on the guest and their mindset. As the days of the traditional hotel lobby begin to wane, these spaces become an important component of wellness in hotel design. The creation of communal spaces that encourage guests to interact with each other and build a sense of community is key. Rather than the hotel bar providing the only space in which guests may become acquainted with each other, hotel brands are finding increasingly innovative ways to create spaces in which groups can come together. From yoga studios and meditation spaces to film rooms and dining areas that encourage guests to share tables as well as stories, these reimagined communal areas create experiences that will ingrain themselves in the memory of those who stay there, providing so much more than just bed and board. Additional small touches in these areas can further enhance this sense of community and meaningful experience. For example the communal library at the Arlo Hotel in New York City, is complete with a record player and vinyl collection which guests are encouraged to use which creates the perfect springboard for interaction and banishes isolation. Flexibility in these spaces is important too. “Architects need to create dynamically responsive places so that they can morph and respond to different uses during different times of the day,” says Dr Eve Edelstein. That could mean a space has to perform as a co-working area by day then has to seamlessly convert into an intimate bar when the sun goes down which poses additional architectural challenges. Whether guests are on a luxurious holiday or working away from home, their hotel room should provide a haven that is a pleasure to spend time in and lighting plays a key role in this. Lighting is an incredibly personal component of design with different guests having different responses to the same lighting scheme. 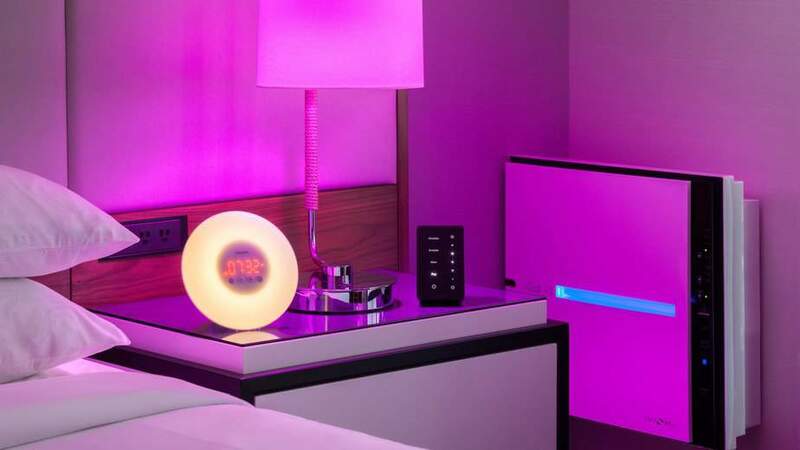 In order to build a lighting scheme that will work for every guest, both on a practical level and in terms of wellbeing, many hotels are harnessing technology to offer a highly customisable scheme that guests can programme themselves. Taking this concept one step further, the Tampa Marriott Water Street Hotel now features circadian rhythm lighting within their special Stay Well Rooms. This is designed to mirror the natural light patterns which will help jet lagged guests adjust to their new timezones and harmonise with their surroundings. The Wellness Rooms offered at Four Seasons Hotel Los Angeles at Beverley Hills also boast circadian lighting settings that are designed to aid relaxation with long wavelength amber tone lighting or to energise guests with blue light that is designed to suppress melatonin production. Lighting that simulates dawn is also becoming increasingly popular as it is also thought to help guests wake up naturally rather than be pulled from a deep sleep in order to ensure the best rest possible. Health and fitness are also important components of the wellness hotel concept but one-size-fits-all gym equipment simple won’t cut it anymore. Many wellness hotels are taking inspiration from the most popular and diverse exercise trends and deliver them in ways that have never been seen before. The new Even Hotel in Brooklyn, a concept by IHG, has gone above and beyond to ensure that wellness is not just bolted on to their hotel experience, but is inbuilt. 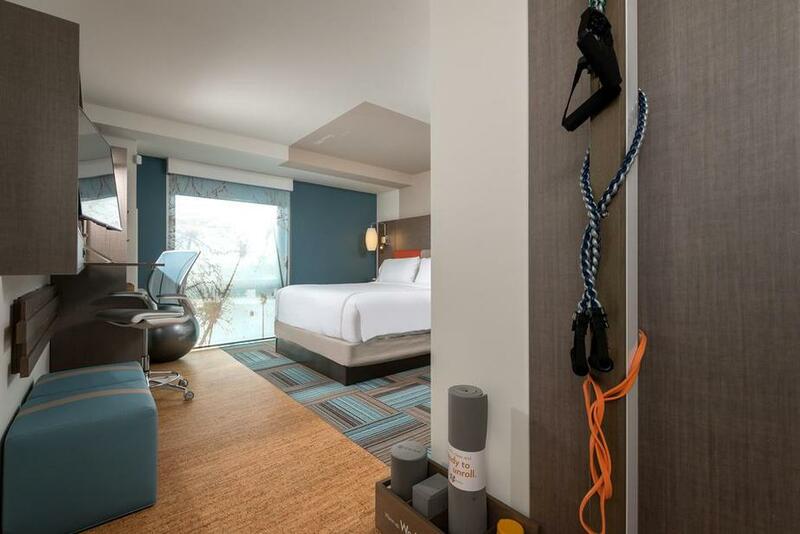 With dietary options for every preference imaginable to in-room training areas complete with workout equipment and cork flooring to ensure comfort and lower impact, this space is both functional and elegant. There is even a hotel app that allows you to select a specially created fitness video to guide you through a workout that is tailored to target everything from stretching to toning and beyond. While spas are potentially important components of wellness hotels, they do not define them. Indeed, in order to create an offering that is truly designed with wellbeing in mind, this has to permeate throughout the venue and impact upon the guest whether they opt to indulge in a spa treatment or not. One way in which this is being achieved is the Incorporation of elements of the spa into the en suite bathroom. This may begin with spa products that go beyond the standard shampoo, conditioner and body wash such as bathing products with aromatherapy properties, and progress to in-room hydrotherapy pools that work to ease away aches and pains. The quality of water itself is also being carefully considered with some hotels including dechlorinator and even vitamin C infused shower systems to invigorate hair and skin and bring the rebalancing effects of spa treatments into the guest’s own rooms. Bringing elements of the outdoor environment indoors and incorporating the organic world into a hotel’s design can have a significant impact on the wellbeing of the guest. Many studies have shown that there are clear connections between proximity to nature and overall wellbeing and happiness. In 2015, the Human Spaces Report showed that there was a 15% increase in perceived wellbeing, as well as a 6% increase in productivity, when biophilic design was incorporated into the workplace. This kind of compelling research has made incorporating biophilia into hotel design a very attractive prospect for hotel brands looking to enhance their offering and tap into the trend towards wellbeing. In essence, biophilic design aims to harness that feeling of harmony created by taking a long walk or gazing at a beautiful landscape and replicate it in the design of the communal spaces and guest rooms. This could involve the introduction of lush greenery or the selection of fabrics that feature organic prints or floor coverings that mimic the natural ground outside. Sound is also an important aspect of biophlic design and moving water is particularly associated with wellness and relaxation. Other hotels take the concept even further by blurring the lines between the interior and exterior spaces. For example, the Juvet Landscape Hotel in Norway offers rooms that are built into the landscape to create a synergy with the dramatic countryside. Not only do hotels that create this feeling of wellness enjoy an increase in repeat business, but incorporating biophilic design can have a more immediate financial impact. In a second Human Spaces Report by Interface and Terrapin Bright Green, it was reported that a huge 36% more guests spend time in hotel lobbies with biophilic design elements compared to more traditional lobby spaces. When this is combined with the fact that lobbies are now increasingly multifunctional with juice bars and eateries available, this presents a revenue opportunity that may otherwise be lost.